Samsung, Nokia, OnePlus, Huawei, Lenovo, Xiaomi, HTC, Vivo, Sony, LG - practically all smartphone makers are gearing up to launch 5G-ready smartphones in 2019. Here's what you can expect. 5G or the fifth generation of network technology has been in testing for the past few years and looks like 2019 will finally see smartphone manufacturers launch devices that can hook up to ultra-fast 5G networks. 5G is expected to bring lower latency to networks, which means online gaming, for one, will become much more faster. Streaming will become a breeze and connectivity in general will improve dramatically. 5G phones are expected to support super speeds of up to 10 Gbps and the network is touted to be 100 times faster than 4G. So naturally, 5G smartphones are all the rage right now and a race of sorts has emerged in the smartphone industry as to who will launch the first 5G-ready device in the market. Throughout 2018, we’ve been hearing from smartphone OEMs about their plans to launch 5G devices. Here, we compile that list of upcoming 5G smartphones, ones that you can also expect to land in India. Take a look. OnePlus announced its plans to launch a 5G-ready smartphone in 2019 and reiterated the same multiple times throughout this year. The industry was expecting the OnePlus 7 to become the first 5G-ready smartphone from the OEM, but looks like the company has special plans for the said smartphone. A spokesperson from the company recently said that 5G will mark the beginning of a new line-up of smartphones from OnePlus. It is expected that OnePlus will launch its 5G phone sometime in Q2 2019 and the company showcased a prototype at the Mobile World Congress (MWC) in Barcelona, ​​Spain. One major shift we expect from OnePlus’ stable is that of pricing. The company has been increasing the base price of its smartphones over the years and with 5G being a hot new feature, one could expect OnePlus to cash in all its chips with the new line-up one 5G phones. Huawei is one of the biggest proponents of 5G technology. The company has been perhaps the biggest names when it comes to the development of 5G network equipment and chips, with hundreds of engineers dedicated towards the efforts. Its first 5G ready smartphone is the foldable Huawei Mate X, which was launched at MWC and is expected to come to India by the end of 2019. Huawei has also conducted 5G trials in India, in partnership with Airtel. Huawei and Bharti Airtel successfully conducted 5G network trials under a test set-up in India. The 5G trial was conducted at Airtel's Network Experience Centre in Manesar (Gurugram). During the test trial, a user throughput of more than 3Gbps was achieved. Xiaomi launched its first 5G smartphone in the form of the Mi Mix 3 5G. The smartphone features Qualcomm’s Snapdragon X50 5G modem and runs on the Snapdragon 855 chipset. It is priced at 599 euros. You can read more about the Mi Mix 3 5G here. In February, Qualcomm announced that it has partnered with 18 OEMs, including HMD Global, the home of Nokia phones, to launch 5G-ready smartphone in 2019. The 5G smartphone from Nokia will be running on the Qualcomm’s X50 5G modem. 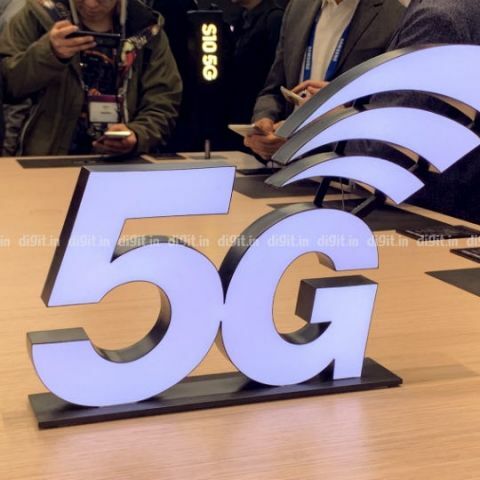 In a demo of the X50 5G modem, Qualcomm was able to establish a 5G connection with greater than gigabit per second download speeds. We don’t know much about which Nokia phone will get 5G support first, but we do know that Nokia is testing the technology internally. Vivo also recently fitted the Qualcomm X50 modem in the Nex S smartphone. According to Vivo, the test completed the first phase of protocol. The company now needs to develop an actual 5G phone and it says its goal is to launch the first batch of commercial 5G devices by 2019. According to the company, China Mobile and Qualcomm have been key partners in the 5G rollout so China could be the first country to get 5G smartphones. But given the China trickle down effect, we expect the 5G smartphone to come to India as well. Vivo’s sister company Oppo also completed 5G tests using the Qualcomm X50 modem on a modified unit of the Oppo R15 smartphone. Oppo has also reportedly planned a 5G smartphone release in 2019. The company's 5G phone has passed 5G CE Certification and is reportedly headed to Europe soon. HTC is not done with the smartphone business just yet. Even though the company has considerably reduced staff, according to its Senior RF designer Kevin Duo, HTC is also sampling the Qualcomm Snapdragon 855 and the Snapdragon X50 5G-ready modem. This means that the company could be looking to launch a 5G smartphone as well next year. Lenovo’s Vice President, Chang Cheng recently claimed that the company is ahead of the others on the 5G curve. The executive has claimed on Chinese micro-blogging website Weibo that the world’s first 5G phone will be from the house of Lenovo and it will be powered by Qualcomm Snapdragon 855 chipset. However, that did not happen since Samsung already launched the Galaxy S10. If Lenovo is readying a 5G smartphone, it is safe to assume that Moto is also working on a 5G device too. In fact, Moto’s 5G Moto Mod with the built-in Snapdragon X50 5G modem has already been successfully tested. However, we highly doubt that the two companies will be first to bring the tech to market. Samsung launched two 5G phones at mwc 2019 - The Galaxy S10 5G and the foldable Galaxy Fold smartphone. Both phones run on the Qualcomm Snapdragon 855 platform paired with the company’s X50 modem. While there is no information on whether the devices will make it to the Indian shores, if they do, they are is most likely to run on the company's Exynos 9820 SoC, which might be again paired with the X50 modem. LG launched its V50 ThinQ at MWC 2019. The phone not only offers 5G connectivity but also supports a second screen. It is powered by the Snapdragon 855 SoC coupled with the Snapdragon X50 5G modem for 5G connectivity, the V50 ThinQ is the company’s first smartphone with 5G connectivity that is slated to be launched in select markets. The device features a 6.4-inch QHD+ OLED display with 19.5:9 aspect ratio and HDR10 support. It sports pogo pins to which one can attach a secondary display that’s sold separately as a case.